The Node.js Foundation just published the results of a worldwide research which was conducted to understand what Node is used for nowadays, and to identify possible improvements for our favorite open-source framework. The survey was conducted online from November 30 to January 16, 2017 via a self-administered survey with 1,405 respondents in total. The responses were analyzed by an independent research consultancy. Let's see what is Node.js used for! Node.js is emerging as a universal development framework for digital transformation with a broad diversity of apps. Sounds fancy! But what does it mean? Well, let's see. Developers mainly use Node.js on the back-end, but it is popular as a full-stack and front-end solution as well. This is no surprise given that one of the main strengths of Node is that you can use the same language on the entire stack. Therefore, all developers can easily understand what is going on on the other side and make changes if necessary. 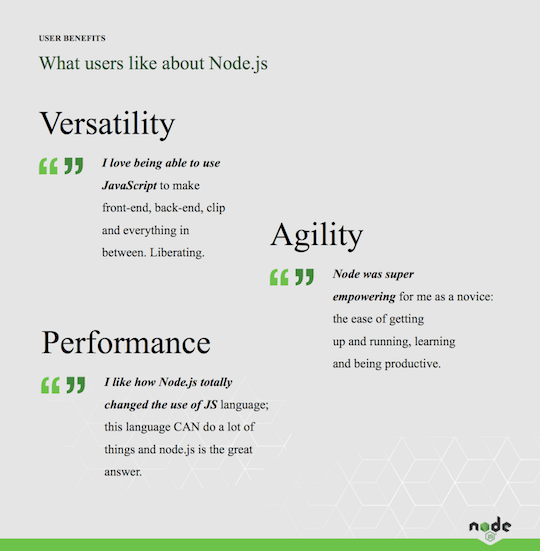 The Foundation asked the respondents about what they build with Node.js at the moment. 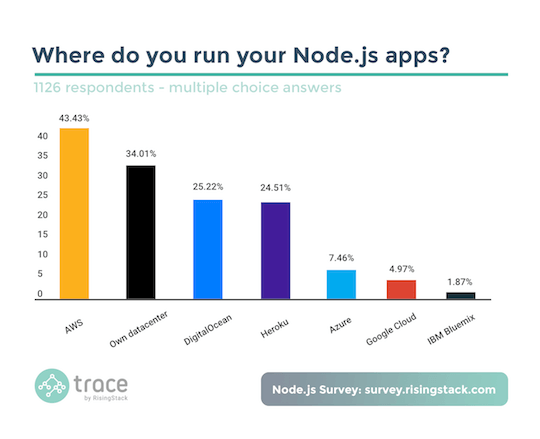 The results show that Node.js is used primarily to build web applications, but we also see that it is a very popular choice for building enterprise applications too. 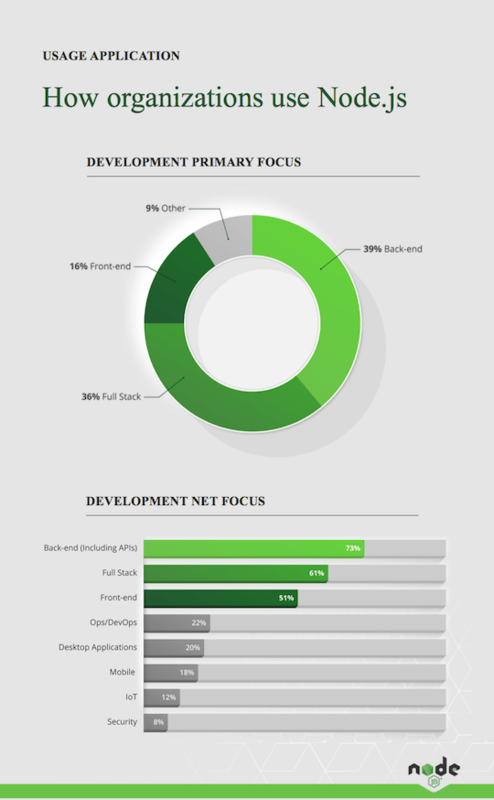 The survey lets us peek into what kind of deployment choices Node developers make. The results show that AWS is the primary deployment location for running Node.js apps in production - but it looks like that on-premises (or self-hosted) infrastructures are extremely popular as well. This data seems to match with what we at RisingStack measured a year ago via our Node.js survey. 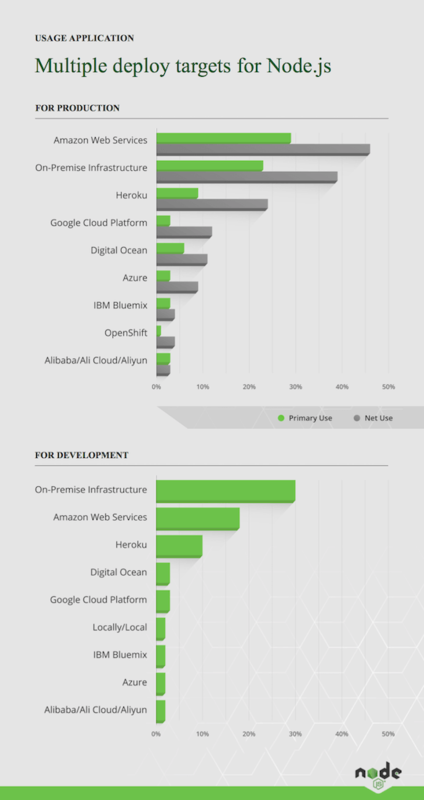 The only noticeable difference is that meanwhile a year ago Heroku and DigitalOcean were competing neck-by-neck for Node developers, now it seems that Heroku gained a little advantage. Since Node.js has LTS (a long-term support plan which focuses on security and stability) since 2015, it's no wonder that huge enterprises constantly add it to their stacks. 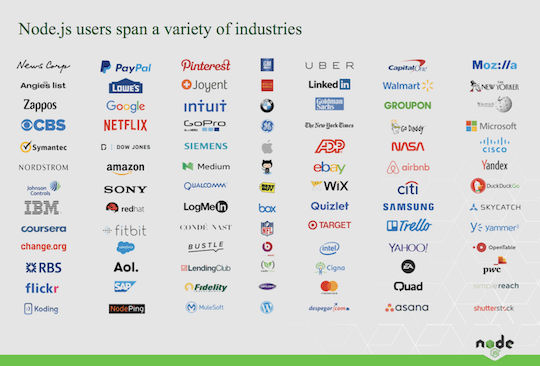 Node didn't just conquer the enterprise sector, but the whole globe too. 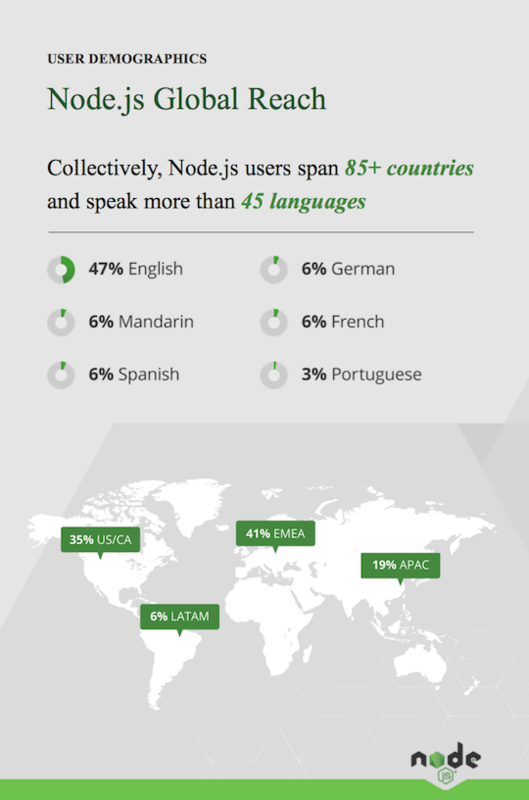 Collectively, Node.js users span 85+ countries and speak more than 45 languages. It is really interesting to see that according to the survey, the majority of Node developers reside in Europe (41%), not in North America. 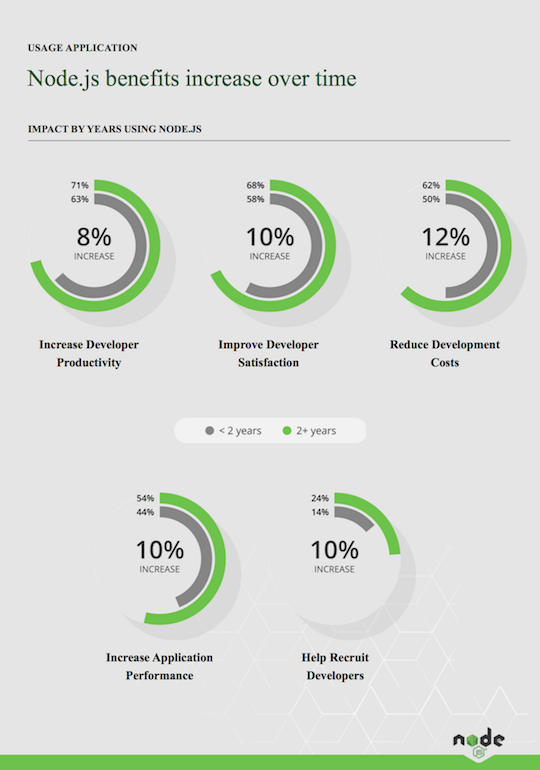 According to the participants of the survey, Node.js increases productivity and application performance in a significant way. Also, it's great to see that the benefits of using Node increase with usage time. Developers and managers who use Node.js for more than two years praise these positive effects even more. 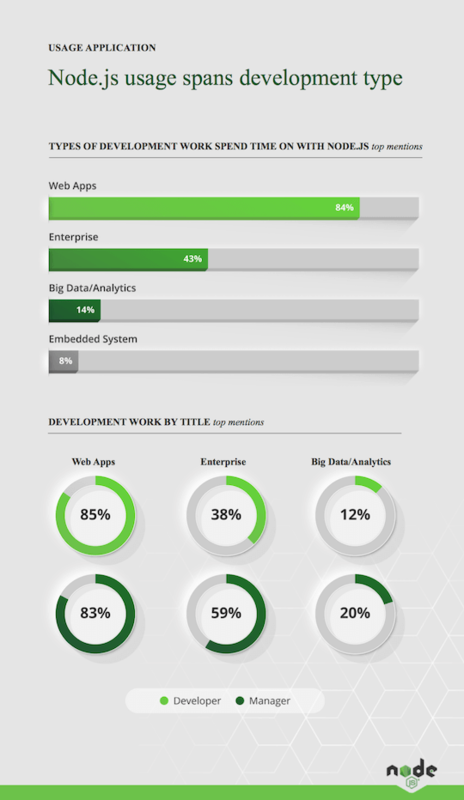 The survey revealed that big data/business analytics developers and managers are more likely to see major business impacts after instrumenting Node.js into their infrastructure with key benefits being productivity, satisfaction, cost containment, and increased application performance. The “typical” Node.js user is college educated in his early 30’s with 6-9 years development experience. 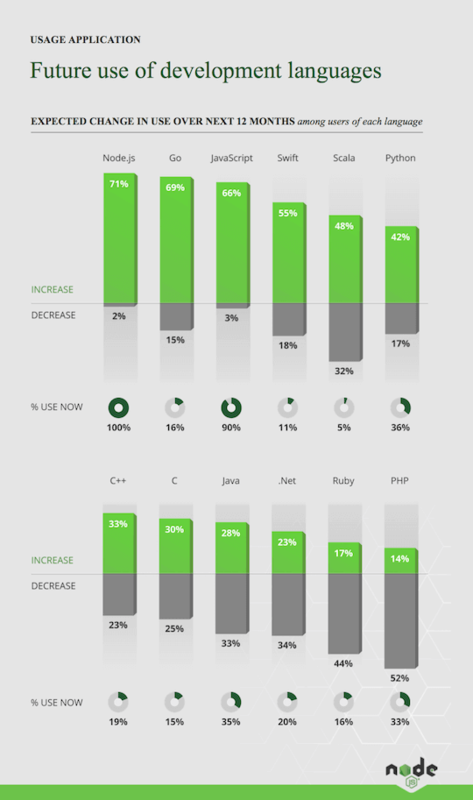 According to the "user demographics" panel of the survey, most developers use Node v6 (57%) and spend half of their time with writing code in Node. 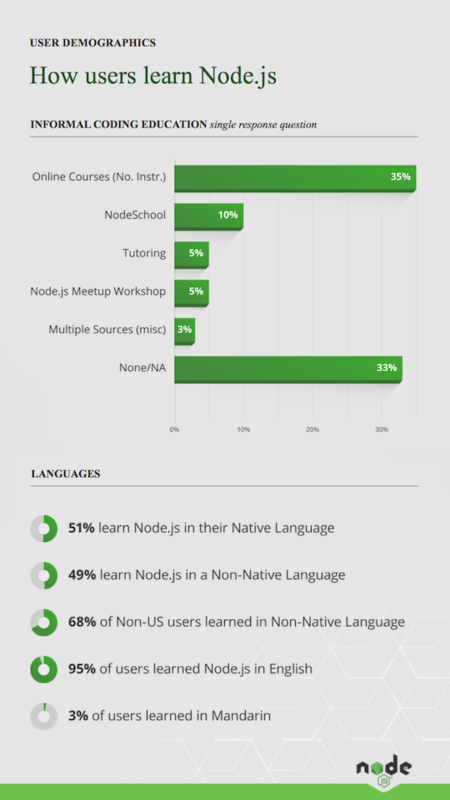 The survey also shows us that the majority of developers improve their knowledge with the help of online courses and resources, and it's great to see that NodeSchool is pretty popular as well. 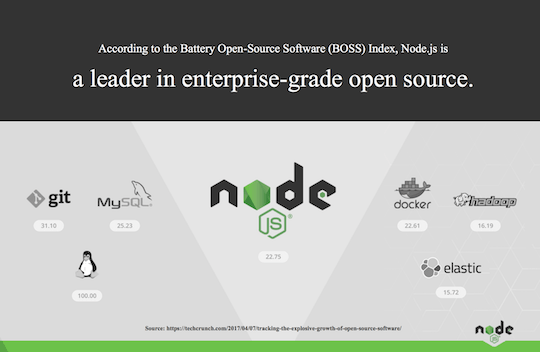 As TechCrunch reported a few months ago, Node.js became a leader in the enterprise-grade open source category. This means that the platform is one of today’s hottest new enterprise technologies. As a result, many big companies — from financial giants to retailers to services firms — are building their businesses around Node.js instead of legacy languages like PHP or Java. With more than 8 million Node.js instances online, 3 out of 4 users will increase their usage in the next 12 months. A detailed guide for building & monitoring reliable Node apps. Learn using npm in an advanced way. Take a deep dive on the internals of Node.js. How to use Node.js to ship better enterprise products faster.